Mouser Electronics, Inc., the authorized global distributor with the newest semiconductors and electronic components, is now stocking the MAX22190 octal industrial digital input device from Maxim Integrated. Designed to reduce power, system cost, and size for programmable logic controller (PLC) digital-input subsystems, the MAX22190 is a highly integrated IEC61131-2-compliant digital input device for industrial, process, and building automation applications. 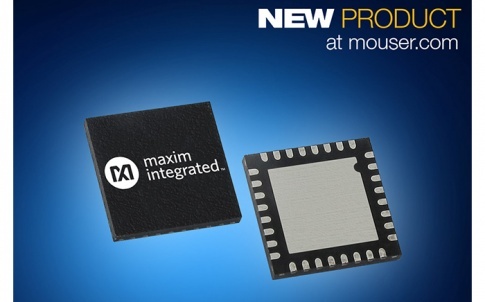 The Maxim MAX22190, available from Mouser Electronics, translates eight 24 V, current-sinking industrial inputs to a serialized SPI-compatible output that interfaces with 3 V to 5.5 V logic. The fault-tolerant, 5 mm × 5 mm device incorporates a current-setting resistor, allowing engineers to configure the MAX22190 for IEC61131-2 Type 1, 2, or 3 inputs. For robust operation in industrial environments, each input includes a programmable glitch filter with an independent delay on each channel that engineers can program to one of eight values between 50 μs and 20 ms or filter bypass. The MAX22190 also offers input protection to ±40 V, wire break detection, overtemperature detection, and CRC communication error. Built-in surge protection of more than 1 kV contributes to increased system robustness and eliminates up to eight external TVS diodes, helping to reduce solution footprint to empower adaptive manufacturing. The MAX22190 device is supported by the MAX22190 evaluation system, which includes a Digilent Pmod-compatible connector for SPI communication and a USBPMB2# adapter board for communicating with a PC. To learn more, visit www.mouser.com/maxim-max22190-input.